Elizabeth Arden Hydrating Mask* // Hydrating face masks are my favourite type to use as dryness is one of the biggest problems when it comes to my skin. This one from Elizabeth Arden is hydrating but also helps to reduce redness and calms the skin. You apply a layer all over the face and leave it on for five or ten minutes then rinse away. It does say you can tissue off the mask but I always prefer to rinse it off. £5.32 for 100ml. Borghese Fango Active Mud For Face And Body // This is a face and body mud mask although I've only used as a face mask. I got this for my birthday after Fleur raved about it. You only need a tiny amount so this tube will last me a long time! As I have sensitive skin I only use this on my t-zone which is the oiliest and most congested part of my face and I haven't had an issues with it reacting to my skin. After I've cleansed and open the pores of my skin I apply a thin layer and leave it on until it dries. I removed it with a damp Liz Earle sponge which helps to remove the mask and also exfoliates the skin slightly at the same time. This mask really does work and clears pores and just makes your skin look fresher. £25 for 7oz or £50 for 17.6oz. 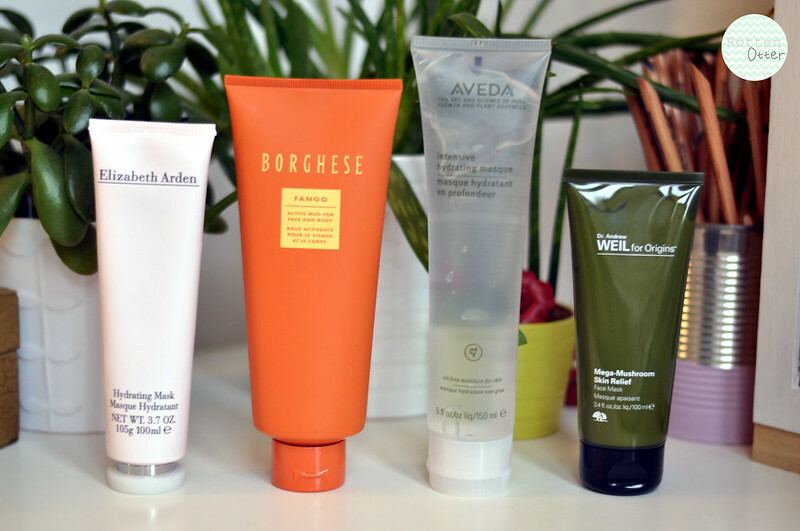 Aveda Intensive Hydrating Masque // I've raved about this face mask from Aveda a lot on the blog recently so I'm not going to go on about it too much here. It's perfect for those with dry and sensitive skin, which is basically my own skin. You apply a thin layer all over the skin and leave it on for about ten minutes before rinsing off and your skin is left feeling incredibly soft and moisturised. You can also use this as an over night mask which I'm yet to try out. I just can't get past the idea of the mask just rubbing on the pillow and all over your hair while you sleep! This is also a great mask to use during a flight as it's clear and no one will be able to tell. Plus as it's so hydrating it will counteract the dryness from flying. I feel like you get a lot product for what you pay so the price doesn't seem to bad. I've used this a lot and it looks like I hardly have! £25 for 150ml. Origins Mega-Mushroom Skin Relief Face Mask // This is the newest face mask to my collection and one that is aimed at reducing redness and calming the skin, which is does really well. I love the serum and moisturiser from the Mega-Mushroom range so I knew I'd like the mask just as much. This is the most expensive mask at £35 for 100ml which although I really do like the mask, I just don't think it's quite worth that much. If it was £25 like the other two masks are then I'd say it would be. Once I've finished this tube I don't think I'd repurchase it as the First Aid Beauty Oatmeal Mask does a very similar job and is cheaper. The Borghese I've been interested in trying since Fleur mentioned it as well :) it's good to know that it worked well for you too!